There’s nothing like a couple of 3-pointers swishing home just before the period-ending buzzers to make a big difference in a close basketball game. Certainly that’s what helped the Minico Spartans get over the hump in a tight Great Basin Conference season-opening contest against the youthful Wood River High School girls’ basketball varsity Tuesday. Minico junior Kailee May (8 points, 4 rebounds) and senior Brylee Mendoza (6 points) beat the second- and third-quarter buzzers with 3-pointers and the visiting Spartans pulled off a 40-27 league victory in Hailey. The Mendoza trifecta, her second of the night, capped an 8-0 Spartan run in the final five minutes of the third quarter—after Wood River’s final lead of the game at 23-22. Wood River’s shot selection wasn’t the best in the second half when Minico’s girls outscored their hosts 22-8. Minico (2-3, 1-0) wound up with five 3-pointers for the game and boasted seven different scorers, although the Wolverines out-rebounded the Rupert squad 35-27. 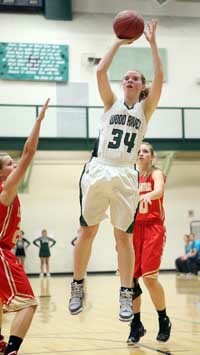 Rotating two seniors and five sophomores, Wood River also made 22 turnovers, to 16 for Minico. Leading Minico were juniors Rebecca Child (13 points, 5 rebounds, 3 steals, 3 assists) and Hannah Bailey (3 points, 9 rebounds). Another junior, Kenna Preuit, added 5 points. Coach Matt Newhouse’s Wolverines (0-4, 0-1) had seized their first halftime lead of the season with a 13-8 second-quarter advantage that included their own 7-0 run. Once again, 6-0 senior post Sydney Tidwell (8 points, 17 rebounds, 9.3 ppg) was a force near the basket but Minico held Wood River’s top scorer without a point after the half. The Hailey girls led 19-18 at half. Sophomore point guard Ciceley Peavey (10 points, 3 steals, 3 assists) led Wood River. Kenya Schott (2 boards, 2 assists) banked home a 3-pointer, and sophomore Haylee Pettit (2 points, 6 rebounds) was tough on the glass. Others were Samantha Sutton (2 points, 2 rebounds, 4 steals, 1 blocked shot), Hannah Belloli (2 points, 4 boards) and Giselle Andrade (3 rebounds). Wood River hosted Jerome (2-2, 0-0)) Thursday and visits Buhl (1-3) Saturday for a 5 p.m. varsity game. Buhl lost a close 49-46 game at Gooding Tuesday.